Biggest Shocker of Captain America: Civil War: Bucky Barnes has been cloned as Super Soldier! It also includes a super fight between Captain America, Iron Man, and Bucky Barnes. In terms of content, the new clips don't add much to what is already known of the film. But from the most recently released clips, some of the scenes teased in the trailers for Captain America: Civil War can now be explained. For one, the chase scene of Bucky Barnes is complete. The scene begins with Bucky Barnes attempting to escape after an explosion is set in the United Nations building, that's where Captain America and his team show up to control the situation. Before Captain America and his team can apprehend Bucky Barnes on their own, Tony Stark/Iron Man and his team are already on the scene. That's where we see Tony Stark/Iron Man pull out his new 'Iron glove' to restrain Bucky Barnes. Tony Stark is accompanied by Black Widow, Agent 13, and Black Panther who attempt to apprehend Bucky but they are unsuccessful in their first attempt. The chase for Bucky Barnes extends out into the civilian area. We then see Black Panther in pursuit, as well as Captain America also in pursuit. The scene after is unknown for the moment, but it appears that Bucky Barnes will be detained at that point in the film. Other than explaining the chase scene, heavily featured in the trailers for "Captain America: Civil War", there is a more important aspect of the film to discuss. Who or What is going to join the fight? Yellow Containment has unidentifiable character. These stills captured from the Captain America: Civil War trailer show a figure in the background of the scene, wherein Captain America and Bucky Barnes are fighting Iron Man. The trailers have emphasized this scene and some keen-eyed fans have caught on to the figure sitting in the background of the stills. In the background, there is a yellow tinted container, with a hulking figure inside. The hulking figure looks to be of Hulk's size, and the face is indiscernible in traits. Although the figure is turned towards the fight happening outside of his containment unit which could mean that the 'thing' in the container will involve itself in the on-going fight between Captain America, Iron Man, and the Bucky Barnes. Most people would assume that the mysterious figure is that of the Hulk/Bruce Banner, but the 'thing' in the container is more likely related to the antagonist element in Captain America: Civil War. There is a possibility that Baron Zemo may have something to do with the containment of that strange 'thing'. Zemo, played by Daniel Bruhl, is set to be the main antagonist of Captain America: Civil War. That being said, Bruhl's character of Baron Zemo could also have nefarious plans for Captain America in the film. What could Baron Zemo have planned in Captain America: Civil War? At first glances, the image of Baron Zemo looks as though he'll be involved in the diplomatic talks when the Sokovia Accords come up, as he's seated in a setting similar to where the Avengers have been seen seated, listening to General Ross(William Hurt) give his speech on the Sokovia Accords; depicted in the trailers for Captain America: Civil War. Zemo could even be the main proponent behind the Sokovia Accords who pushes its legislation into action. Apart from the Sokovia Accords' main purpose being to regulate the deployment of 'enhanced' individuals, there may also be a sub-clause in the Sokovia Accords that would include a Super Soldier' deterrent if registrants refuse to abide by the Sokovia Accords. The idea of the Super Soldier was first introduced in Captain America: First Avenger(2011), reinforcing the idea beginning in "The Incredible Hulk(2008)". The Super Soldier serum is what gave Steve Rogers his ability to become Captain America, and the same serum that several other Marvel characters have had a history searching for. From the Red Skull to General Thaddeus Ross (who, lets not forget, is actually in Captain America: Civil War), the Marvel universe has had many character-leading expeditions to attain the Super Soldier Serum. And there may be some development on that end in Captain America: Civil War. The containment module holding that mysterious figure in the container is likely a Super Soldier clone developed by an unknown source as of yet, possibly associated with Baron Zemo to some degree. Dr. Erskin. Super Soldier creator. But, how could someone obtain the lost super soldier serum? Since the formula to create Super Soldiers had been lost due to the death of its creator in Captain America: The First Avenger, no one in the MCU' has been able to replicate the formula since. There have been several attempts to do so, one in specific was made by General Thaddeus Thunderbolt Ross, in "The Incredible Hulk(2008)". During the film, General Ross' main goal was to recapture Bruce Banner/The Hulk to extract and replicate the Super Soldier formula from the Hulk's blood. To step back, Bruce Banner wasn't knowingly given the Super Soldier serum. He was unknowingly infected with a manufactured derivative of the Super Soldier serum, during the accident which exposed him to the gamma radiation that transformed Bruce Banner into the Hulk. On General Ross' mission to reclaim the lost Super Soldier serum, he utilized another manufactured derivative to create the Abomination. By injecting his lieutenant, Emil Blonsky with the derivative Super Soldier serum, General Ross inadvertently created the Abomination. Abomination was a hulk-like creature that was defeated by the Hulk/Bruce Banner before the conclusion of the film, but we haven't seen Emil Blonsky or the Abomination since. Could Abomination be the mysterious figure in the containment module? Nothing has confirmed the connection between "The Incredible Hulk(2008)" and the rest of the MCU' except the ending credit scene of "The Incredible Hulk(2008)" which has Tony Stark(Robert Downey Jr.) of the Marvel Cinematic Universe going to General Ross about the Hulk dilemma. That could place Tim Roth's character of Abomination as a plausible candidate for the mysterious containment. Super Soldier clones are the answer to the Avengers' rampage. Back to Captain America: Civil War. The Sokovia Accords are being implemented to keep enhanced individuals in check and held accountable, but if enhanced individuals aren't cooperating with Iron Man and his enforcers, then the United Nations, the proponents behind the Sokovia Accords in the film, could have resorted to manufacturing deterrents for enhanced individuals like Super Soldier clones to take on those who don't abide by the Sokovia Accords. Were they to get an opportunity to gather a decent sample of Steve Rogers' blood to duplicate the Super Soldier serum inside of him, then there would be no stopping anyone from recreating Captain America, just as Red Skull attempted. Or maybe creating another Abomination. There is also the matter of 'Crossbones' going toe-to-toe with Captain America in the film, with Crossbones not having the physical attributes to match a Super Soldier like Captain America, could he be given a type of Super Soldier serum that would augment his abilities as well? 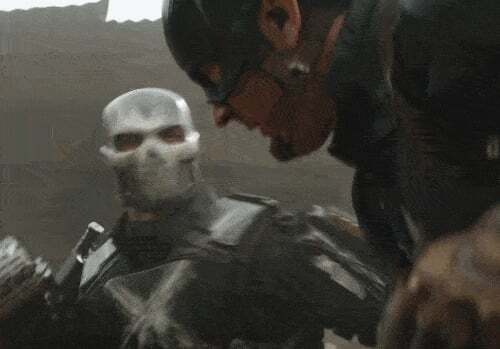 It appears so from the promotional footage for Captain America: Civil War showing Crossbones giving Captain America a hard time holding his own in battle. William Hurt in "The Incredible Hulk"
What's most likely to be in that containment. To round out the theory on 'what' is in the containment module, in the picture of discussion. There are several possible Marvel characters that 'it' could be. In the most plausible set of circumstance, the unidentifiable 'figure' is a Super Soldier clone created after General Ross(William Hurt) gets a sample of the Super Soldier Formula close enough to the original formula that he has a controllable Hulk-type of enforcer. The only other reasonable guess could be that Abomination/Emil Blonsky has been kept in captivity since "The Incredible Hulk(2008)" and he's in the containment module. His appearance wouldn't haven't changed much but if experiments were conducted on Abomination, he could easily have a new look in Captain America: Civil War. However, to a stretched line of reasoning, the Super Soldier clones may be created after Captain America/Steve Rogers agrees to be taken in by Iron Man and his team. At that point, Steve Rogers may be requested to give a sample of his blood as a requirement of the Sokovia Accords, for purposes of cataloging 'enhanced' individuals; but wherein the sample is used to replicate the Super Soldier Formula in Steve Rogers' blood. He does have the original. Other than that, it's open season on guesses in trying to determine who is in that containment. The most popular theory online right now, is that the containment either has a clone of Bucky Barnes/Winter Soldier inside of it, or the real Bucky Barnes has been in captivity since before "Captain America: Winter Soldier". There are TWO! Bucky Barnes in Captain America: Civil War. Bucky Barnes, Super Soldier Clone. How did we all miss the subtle clues that gave away the biggest reveal in Captain America: Civil War? For months, we've all been trying to figure out who the mysterious figure in the "yellow-tinted" container is. Speculating that the containment could house Emil Blonsky/Abomination, the Hulk, or any number of other possibilities. The answer has been in front of us the whole time. In the image, embed above, we can see Iron Man, Steve Rogers, and Bucky Barnes fighting in front of the aforementioned containment unit. We can't clearly see who is in the containment, but the next image will make the scene clearer. Bucky Barnes' Super Soldier Clone. n the image posted above, do you notice the yellow tint as the surrounding arc around 'Bucky Barnes' is lifted? It's the same containment unit shown in the first image, mentioned. But how could that person be Bucky Barnes if we can clearly see Bucky Barnes in the midst of a fight with Iron Man and Captain America? The reason that we see 'Bucky Barnes' in the containment, as well as in the midst of a fight with Captain America and Iron Man is because that person isn't really "Bucky Barnes". The person we see in the image above is the "Proto-Husk" of Bucky Barnes. In Marvel Comics', the "Proto-Husks" were clones of fallen heroes like Bucky Barnes, engineered by Arnim Zola to be newly donned Super Soldier clones. But how can we prove this theory to be true? Simply that is. Aside from the containment module displaying the Super Soldier clone of Bucky Barnes, there's one other clue to determine that the person we see hooked up to that containment isn't the 'real' Bucky Barnes. Looking closely at the cybernetic arm of the 'Bucky Barnes' in containment, the shoulder should have a red-star on it. And to put your minds at ease, without any speculation needed. Looking closely at the image of Bucky Barnes above, and the opposing image of the fight scene between Captain America, Iron Man, and Bucky Barnes, both 'Bucky Barnes' and the mysterious figure in the "yellow-containment" are wearing a type of face-mask, similar to the one Bucky Barnes wore in Captain America: Winter Soldier. On top of pointing out the face mask, there's no star on the cybernetic arm of the 'Bucky Barnes' we see hooked up the containment unit, but in this still from Captain America: Civil War, the star can be clearly seen on Bucky Barnes' shoulder. Which means that there are "two" Bucky Barnes in the film, well one of them is a clone of the original. But which one is the 'real' Bucky Barnes? Is the containment unit mentioned, housing a 'Bucky Barnes' clone or has the Bucky Barnes/Winter Soldier we've been introduced to in Captain America: Winter Soldier been a clone all along? The only fact we can confirm is that actor, Sebastian Stan will be playing two versions of 'Bucky Barnes', one of them being a Super Soldier clone. Could Iron Man and Captain America have learned of the clone of Bucky Barnes, allying them one more time before the conclusion of Captain America: Civil War? Super Solider clone of Bucky Barnes. no star. Read next: Bizarro? White Martians? Supergirl's Adventure Has Only Just Begun! Bizarro? White Martians? Supergirl's Adventure Has Only Just Begun!